Solid copper conductor rods are first inserted into a vertical 2.5" diameter copper tube 30 foot long, kept at the correct spacing with mineral insulated block inserts. The tube is packed with magnesium oxide, which acts as a seal and fireproof insulator. The end of the copper tube is sealed off and a steel draw wire attached. Using special machinery, the filled tube is put through a swaging process which reduces the sheath and conductor diameter proportionately while lengthening the cable. For example, a two conductor cable 16 AWG. has a nominal length of 1221 feet. Swaging or drawing down locks the conductors into place so the position of the conductors inside the sheath never vary, even when formed or bent. During the swaging process, the cable is put through an annealing process to align the copper molecules and keep the cable flexible. By using mineral insulated cable, you not only eliminate the uncertainty of conduit and wire, but also the cost of additional materials, including pull boxes, unions, grounding wires, conduit seals and other fittings. Pressure tested to 2000 psi, mineral insulated cable delivers superior performance by blocking the passage of vapors, gases, liquids and flames; eliminates pressure piling and confines any exploding gases to their immediate area. With conduit, seals must be placed within 18" of the arcing device or instrument to be connected to the conduit system. If a conduit seal fails, gas or liquids can migrate freely and it is for this reason that some companies require single or double conduit seals in hazardous areas to be annually x-rayed and inspected. Standards for Safety: UL 2225, Cables and cable fittings for use in Hazardous locations. CAN/CSA C22.2 No. 174, Cables and Cable Glands for Use in Hazardous Locations and meet the requirements of NEC Article 501-5 (f)(3). The inorganic construction of MI cable makes it extremely fire and heat resistant. With an operating limit equal to the melting point of copper, 1982ºF, 1083ºC - it can easily withstand high temperatures and heavy current overloads, does not emit smoke or toxic substances and allows no flame propagation. 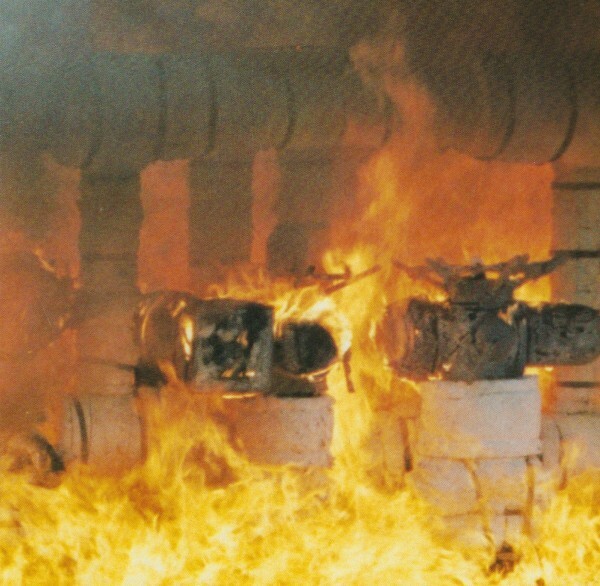 In contrast, a third-party test proved standard conduit and wire failed at 425ºF. 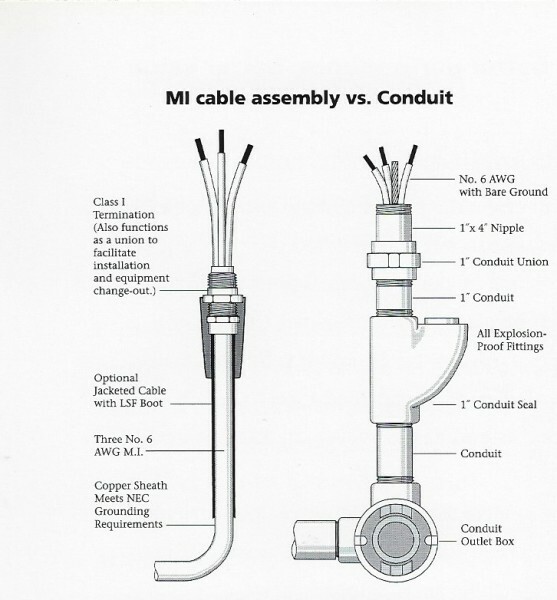 These fireproof properties make MI cable assemblies the best choice for connecting motor operated valves, control stations, plant shutdown systems, instruments and power devices that must remain operational under actual fire conditions. Mineral insulated cable and cable assemblies are extremely reliable as power and control cables in hospitals, hotels, high rise buildings for emergency generators, fire pumps, smoke and vent exhaust fans, communication circuits, multiplex alarm systems and instrumentation. Other applications include wiring connections to electric heaters on boilers, tanks and furnace wiring, metal smelters and lumber kilns, where regular PVC insulation hardens and cracks and has to be replaced regularly. Mineral insulated cable does not deteriorate at low temperatures and assemblies are unaffected by extreme changes in temperature. Daily temperature changes cause condensation and moisture to accumulate in exposed conduit above the seal packing, causing rust and corrosion to build up and block the conduit drain. In cold temperatures this moisture can freeze, splitting the conduit or seal and possibly damaging the instrument or electrical device, especially if the wiring is top entry. Because MI cable assemblies are solid and completely moisture resistant, this risk is eliminated. 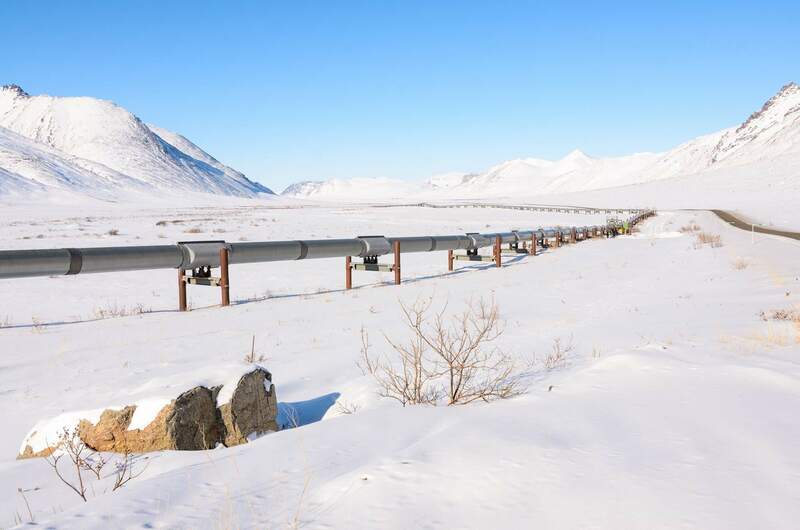 Industrial applications include power wiring to motors in LNG tanks, freezer rooms and instrument connections in harsh climates such as Alaska and Canada. The cable is solid and constructed with an extruded copper sheath that makes it impervious to liquids. Neither water, process liquids or corrosive solutions can migrate into the system. In copper and brass corrosive environments, or for direct burial. An extruded outer polyolefin jacket may be specified to provide additional protection. Arctic grade low smoke/fume PVC shrouds cover the brass connectors. Epoxy potted terminations provide lifetime sealing to moisture ingress. Industrial applications include light fitting connections in oil tanks that are periodically washed out with kerosene. MI cable assemblies are US Coast Guard approved and are currently used to connect warning beacons and also solve many electrical wiring problems on oil tankers and marine vessels that operate under the worst of climatic conditions. 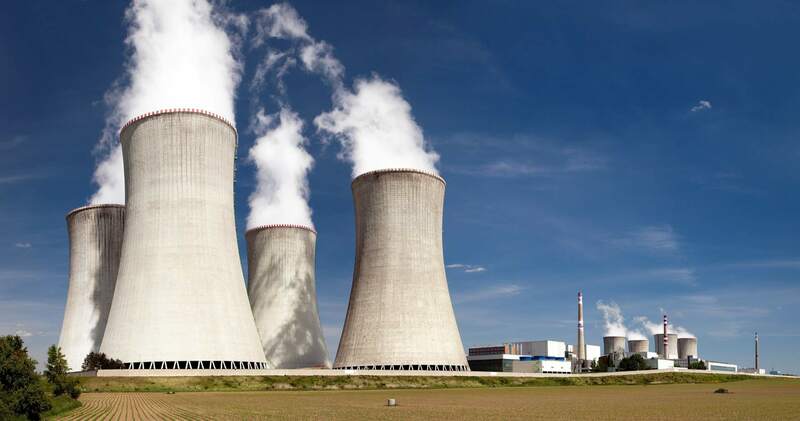 Magnesium oxide, the insulation in mineral insulated cable, provides superior radiation resistance over any other material and for this reason, MICC cable assemblies are an excellent choice for nuclear power plant applications.